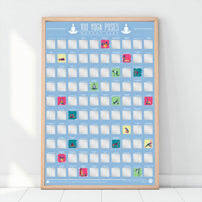 Browse our selection of new arrivals for the latest and hottest novelty gifts, gadgets and personalised presents at ExactlyWhatINeeded.com. Stay one step ahead of the curve with a range of gifts and accessories that you can be sure few people have got their hands on yet. Enjoy superfast delivery for all your last-minute needs when you buy gifts online at ExactlyWhatINeeded.com. 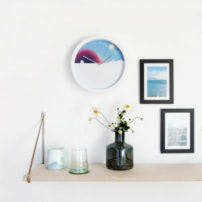 Hang this unique clock on the wall and enjoy the view from dusk ’til dawn. The skyline gradually rotates as the hands move, so what you see on the face always matches the daylight outside. Spans a full 24 hours. Office worker by day and high-speed, high-risk, low-vis cyclist by night? 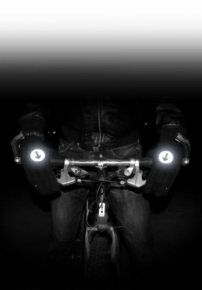 Seamlessly shift from work to the commute with our reflective cycling gloves. They are not a replacement for other safety clothing, but a compliment to the lights and high-vis vests every cyclist should wear. They have a reflective patch on each side, so you can be spotted before you turn with added visibility. 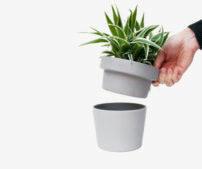 A two-part ceramic plant pot with a hidden compartment. This cleverly designed hideaway provides the perfect secret spot for your valuables. It also acts as a great desk or home tidy, so you can keep all the small stuff organised and out of sight. Whether it’s lose change, house keys, herb-cutting scissors or stationery, this hideaway makes for a unique and attractive storage solution. The ultimate school bag for little legends. A mini guitar-shaped backpack covered in awesome artwork, with plenty of space inside for all the school day essentials. Be the coolest kid in the playground. Fool your pets into thinking a real goldfish is swimming in their water bowl. The 3-dimensional, hand-painted ceramic goldfish sitting at the bottom of the dish will convince even the most canny cat that they have a surprise visitor. The perfect gift for pet loving tricksters. 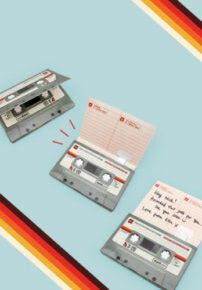 A cassette-tape-shaped greeting card for sending recorded messages to friends and family. When a hand written message doesn’t quite cut it, send a sound recording in the form of a retro mixtape. 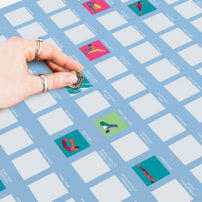 Record for up to two minutes, handwrite a message, seal with the included sticker and send off to the lucky recipient. Your message will play automatically when the card is opened. 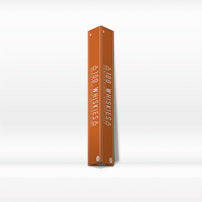 Re-recordable and endlessly re-useable so you can pass messages back and forth forever. 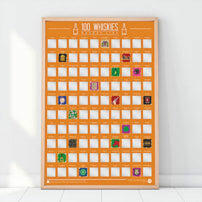 A double-sided paper poster and set of 10 number cards. 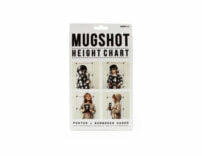 Create a convict-style case file on the growth of your little terrors, complete with photographic evidence! 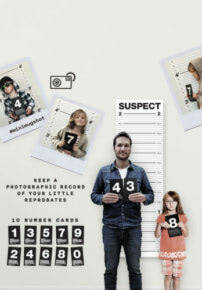 Start by ensuring the poster correctly records the height, then ask the suspect to hold the numbered age cards in front of their chest. Take two photos, one front-view, one side-view, and you’ll have an almost official criminal record to add to the photo album. A light-hearted gift for friends with adorable (crazy) kids. 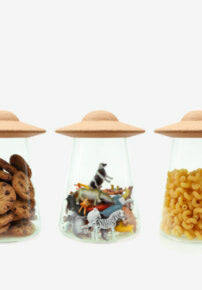 A glass storage jar with a solid cork UFO lid. The green-tinted glass shaped like a light-beam will make the contents appear to have been abducted by an alien life form. Perfect for cookies, sugar cubes, cereal, pasta, tea, coffee and any other small items that need a home. This is one versatile storage solution that you won’t want to hide in the cupboard.